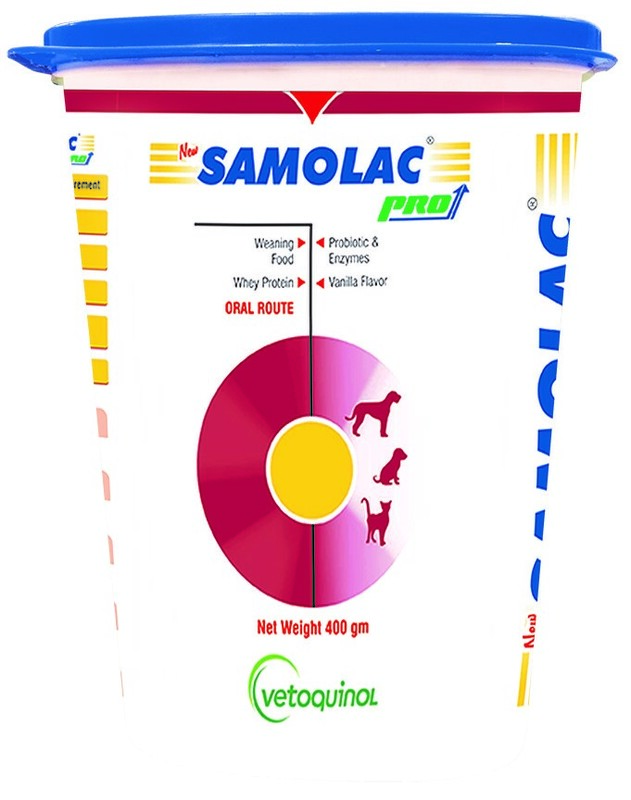 New Samolac Pro helps to meet the nutritional requirement after weaning, it contains saccharomyces boulardii which helps to killing bad bacteria and maintain the good bacteria. Improves the gut health.Digestive enzymes supports in digestive function and reduces the gut inflammation. Also it contain whey protein for development of muscle and immunity. 10 amino acid and vitamin mineral for overall body growth and development. It have taurine for cognitive development. Boil drinking water for 5 minutes, leave it till lukewarm. Pour 30 ml of lukewarm water in a bowl & add 20 g of New Samolac PRO to it & make a smooth paste. Give 4 - 5 feeds per day. Your veterinarian is the best source of advise regarding your pet's needs.